Congregations today face a multitude of challenges in trying to adapt to a quickly changing world. Balancing new concerns with core values is a complicated process that can leave too many members feeling that their voices and needs are not being met. 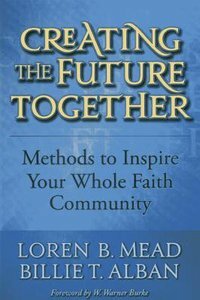 Loren B. Mead and Billie T. Alban have developed Creating the Future Together to share their knowledge of how congregations can use large group methods to navigate these new waters. Large group methods involve getting all the stakeholders together to work on major issues of common concern. Mead and Alban outline four such methods--two for identifying a preferred future and two designed to create community and discover common interest. This book is not meant to be a how-to volume; its primary purpose is to familiarize leaders with these whole-system approaches and to provide a conceptual framework for evaluating their potential usefulness against any given challenge. The authors also share stories from a variety of Christian and Jewish faith communities where ordinary religious leaders, lay and clergy together, have faced issues related to change using large group methods. Combining their wealth of experience in leading religious and secular bodies through times of change, Mead and Alban bring hope to faith communities as they work to embrace, and even thrive through, the need for change. About "Creating the Future Together"